How to Prevent Serious Accidents on the Way to School | Hupy and Abraham, S.C.
August is National Back to School Month. 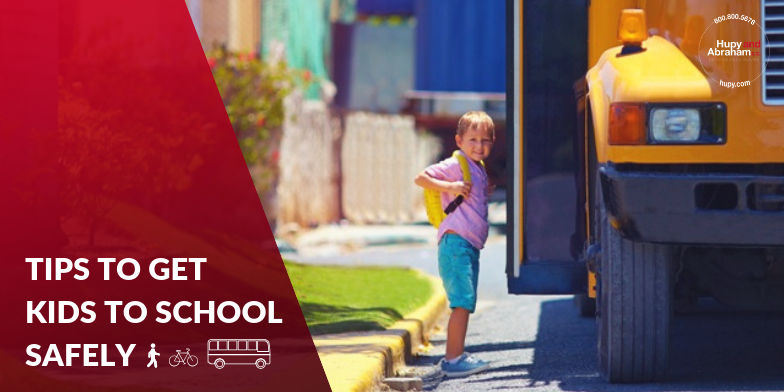 As students plan to return to school, the National Safety Council has prepared some safety tips that will help students get to school safely regardless of how they travel. Drivers can be diligent. All drivers should be careful not to block crosswalks, to abide by school bus stop signs and flashing lights, and to yield to pedestrians. Parents can teach their children to be safe walkers. Pedestrians should use sidewalks wherever possible, always stop and look before crossing a street, and never text and walk. Parents may choose to practice walking to school with their children to review the route and safety lessons. Parents can set safety rules for children biking to school. These rules may include always wearing a helmet, using hand signals when turning, and wearing bright colors so that they can be easily seen. Parents can talk to their teen drivers about safety issues. Teen drivers need to follow all of the usual safety rules, but may also benefit from a special reminder to watch for other children traveling to school. School staff can teach children about bus safety. This includes teaching children how to get on and off the bus, where to line up to get the bus, when to cross the street to get on the bus, and waiting for the bus to come to a complete stop before approaching it. Even if all of these precautions are taken—accidents can still happen. If your child has been hurt because of someone else’s negligence then your child may have the right to make a fair legal recovery. The process of making a fair legal recovery does not have to interfere with your child’s education or physical recovery. To learn more about what you can do to protect your child, please call us at 800.800.5678 or text us today to schedule a free, no-obligation consultation with an experienced personal injury lawyer.